The holidays can be tough on your skin. The dry winter weather, the not so healthy indulgences, the family stress! Fortunately, we have a fun solution. What if you could turn your holiday ingredients into a revitalizing, anti-inflammatory face mask? Try this fun and simple recipe that the whole family can enjoy! The entire team at Moy, Fincher, Chipps Facial Plastic and Dermatology is wishing you and your family happy holidays. Below are the simple ingredients and directions you’ll need. Enjoy! Stir until well mixed and a smooth consistency is achieved. Apply the mask to your skin. 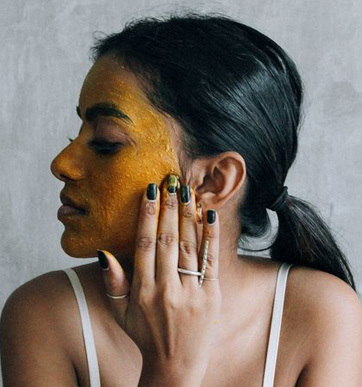 Turmeric has been shown to exhibit anti-inflammatory, anti-neoplastic, antimicrobial, and antioxidant properties.The same chemical that gives turmeric its yellow color, curcumin, may be responsible for helping treat a variety of dermatologic diseases, such as rosacea and eczema. Cinnamon is a potent spice. It has been used for thousands of years not just for its aroma, but for its powerful medicinal properties as well. Cinnamon contains antioxidants, which fight damaging free radicals that damage your skin’s elastin and collagen, contributing to aging. Honey has been used for thousands of years as a skin remedy. Its antimicrobial properties help treat skin bacteria in a natural, chemical-free way.